If it's part of your job to interact with people, then it's part of your job to participate in negotiations, or conversations with the intention of reaching agreement. And those who negotiate are often perceived as and groomed to become leaders. But don't wait for the powers that be to see you as a leader. 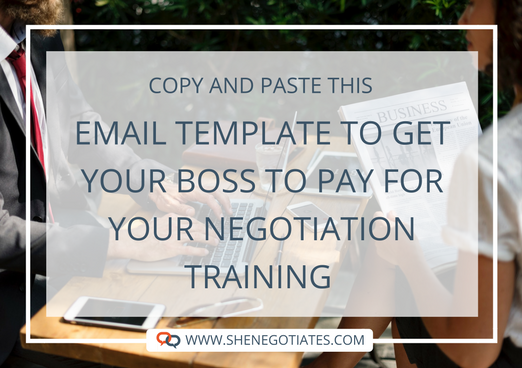 Instead, take the lead in developing your negotiation skills. Your future potential -- as well as your future wages -- will thank you. I appreciate that our company has a culture of supporting continuing education, professional development and a more diverse pool of future leaders. To that end, you've also mentioned in the past that the company will cover expenses for us to attend events, such as marketing Conference X that (coworker) attended, as long as they benefit our team. I'd like to attend a training called "X", an experiential workshop for professional women on key communication skills for influencing, negotiating and leading. I think gaining these communication skills will help me grow and enable me to contribute to the team in a bigger way. At our recent one-on-one, you shared with me how you'd like me to step up in my role as account manager (or your job title) and be more assertive with clients and partners. I've wanted to do exactly that but wasn't sure how to go about effectively communicating our values and benefits while dealing with some of the big personalities on the client side. Attending this training is the perfect opportunity for me to learn exactly how to do that in a win-win approach, so that we can build on and generate more value from collaborative partnerships. I'm hoping to gain the confidence and skill to become more proactive and vocal in my day-to-day interactions with both clients and internal stakeholders. Is this something that I can pursue through our department? If it is, would there be interest in sending more of the women in our department? Please let me know if you have any concerns. I'd be happy to schedule a time for us to chat next week and figure out where to go from here. Thank you for being open to these kinds of suggestions and for supporting my growth and development here. Did you notice how the email accomplished the following?